According to the Centers for Disease Control, almost 17 percent of children ages 2 to 19 years old are obese in the United States. Helping your child achieve and maintain a healthy weight is an important job for any parent or caregiver. Remember, every child is a different size and grows at a different rate. If you are concerned about your child's weight, talk to your pediatrician or health care provider. The average infant weight is 5 1/2 to 9 1/2 pounds. Infants generally lose about 5 to 10 percent of their body weight during the first week of life but should start gaining weight after the second week. Infants grow at a tremendous rate, and by four to six months usually double their birth weight. Growth spurts may occur during the second week and sometime between the third and sixth week. You might notice your baby is hungrier during these growth spurts. Feed her more often to meet her extra caloric needs. An infant will usually triple her birth weight by the time she turns 1. The average 1-year-old boy weighs between 19 and 27 pounds. The average 1-year-old girl weighs between 17 1/2 and 25 pounds. Between the ages of 1 and 5 your child will usually gain about 10 pounds, five pounds between ages 1 and 2 and the remaining five pounds between ages 2 and 5. The average 2-year-old weighs between 22 to 33 pounds. 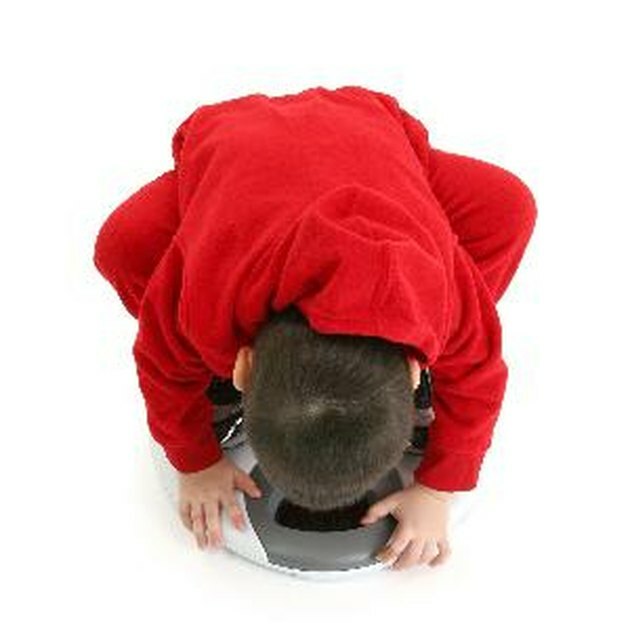 The average 4-year-old weighs between 28 and 44 pounds. You might notice your preschooler has less of an appetite or becomes a picky eater. These are normal phases, and a decreased appetite can be a sign of slower growth. Continue offering healthy foods for meals and snacks, and don't be concerned if your preschooler refuses to eat at times or can't seem to get full at others. Most health care providers will use either a BMI chart or growth chart to measure your child's weight. BMI, or body mass index, is a calculation using your child's weight and height that measures body fatness. The CDC has four weight status categories based on BMI percentiles. A BMI between the 5th and 85th percentile is considered normal weight. If your child is below the 5th percentile she is considered underweight. If she is between the 85th and 95th percentile she is considered overweight, and the 95th percentile or higher is obese. There are calculators available online to determine your child's BMI. Growth charts may also be used to plot your child's weight. Your child should stay around the same percentile on the growth chart as he gets older. Most children between ages 2 and 10 grow at a fairly steady rate. According to the CDC growth charts, 5-year-olds should weigh between 34 and 52 pounds, 7-year-olds should weigh between 40 and 66 pounds and 10-year-olds should weigh between 54 and 105 pounds. Sometime between ages 9 and 15 your child will experience another growth spurt. At this age, the growth spurt is a sign of puberty. This may last two to five years. Usually by the time a girl is 15 years old and a boy is 16 or 17 they have reached their adult height. A healthy weight for your teenager depends on his height and when his growth spurt occurs. Monitoring his BMI during these years is the best way to determine if he has a healthy weight. According to the CDC growth charts, an average 12-year-old weighs between 66 and 130 pounds. Fifteen-year-old boys usually weigh between 94 and 174 pounds, while 15-year-old girls weigh between 90 and 168 pounds. A healthy weight for an 18-year-old boy is between 116 and 204 pounds, and a healthy weight for an 18-year-old girl is between 100 and 178 pounds.